ere isn’t one. The answer is simple, yes, it is dangerous. 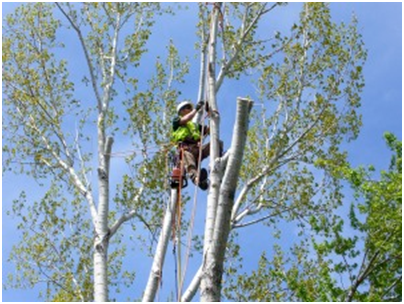 No matter which way you spin it, this job contains some inherent risk, anytime your running a chain saw, climbing in a tree, or running a chain saw in a tree, you are putting yourself at risk. they are still dangerous and you continue to do them. Tree climbing is the way i make my living and something that i love dearly. Sure it is dangerous, but when done properly it is not nearly as dangerous as one would think. In this business there are many people who like to cut corners and would put that themselves at incredibly more risk than needed simply because they are lazy. Tree climbing can be a safe thing to do if proper safety precautions are followed. When I am in a tree, or have one of my guys up in a tree I am a stickler for safety. I stress that safety is the number one thing and that there is no excuse to do anything that is unsafe. As a quality tree care professional I maintain the highest safety standards without sacrificing the quality of the tree care. So the next time that you see someone working up and a tree and think that he must be crazy and not care about his life to be up there remember that yes it is dangerous, but when done properly it can be much safer than you would guess. As a tree climber this is a question that I am constantly asked from both people who watch me climb as well as by people who simply hear in social settings that I am a tree climber. As much as I would love to have some elaborate answer to this there isn’t one. The answer is simple, yes, it is dangerous. No matter which way you spin it, this job contains some inherent risk, anytime your running a chain saw, climbing in a tree, or running a chain saw in a tree, you are putting yourself at risk. However, something that I like to point out to people is that driving down the road is also dangerous. Now I am sure that your thinking, well of course it is, but no where near as dangerous as hanging off the side of a tree with a chain saw is. You would be correct with this response but my point is that there are lots of things in life that come with danger. Maybe not as dangerous as tree climbing, but they are still dangerous and you continue to do them. number one thing and that there is no excuse to do anything that is unsafe. As a quality tree care professional I maintain the highest safety standards without sacrificing the quality of the tree care.